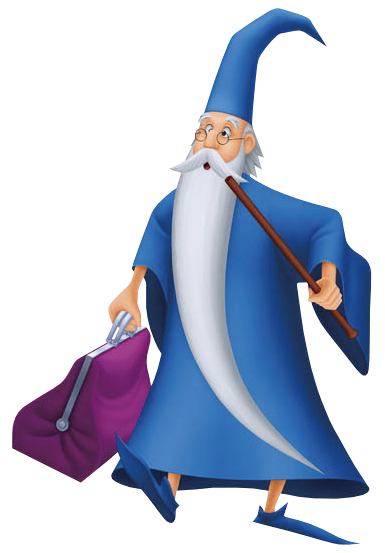 A wise and powerful sorcerer second to none, he taught Sora and friends about magic at the behest of King Mickey. Sora and company first encountered Merlin in an abandoned house in Traverse Town while running an errand for Cid. Sora was surprised to hear that Merlin was expecting them and asked if he was a Heartless. Merlin explains that he is a sorcerer, often away from home, and tells Donald and Goofy that the King has requested his help. He is pleased to see that the two have found the ‘key'. After unpacking his things from his magical bag and transforming the run-down shack into his study, Merlin informs them that he will be their teacher in the art of magic. He also introduces the three to Fairy Godmother. Afterward, Sora gave Merlin the old book Cid had asked them to deliver. Merlin thanks them, but when asked what kind of book it is, he replies that he does not know and that it is not even his. The book strangely appeared in his bag one day and he asked Cid to repair it for him. However, he does know that the book is special and the missing pages will reveal its secret. He tells Sora that he can look at it anytime he likes and asks him to give his thanks to Cid. Merlin trains Sora in the hidden upper floor of his study. He awards the three with special weapons - the Spellbinder, the Dream Rod, and the Dream Shield - when they reach specific levels of proficiency in the magical arts. A powerful wizard and Donald's magic teacher. In the past, Sora met Merlin in Traverse Town and learned magic from him. When the worlds were restored, Merlin traveled with Leon and the rest of the refugees back to Hollow Bastion where he found himself a new home. Despite being at odds' ends with Cid, Merlin helped the Hollow Bastion Restoration Committee and let them use his house as a meeting place. That was also where he kept Pooh's book while Sora looked for the torn pages the Heartless stole from it. Merlin is as wise as he is old, and was a regular source of advice for the party. When Disney Castle was facing a crisis, it was Merlin the Queen suggested they consulted with. As expected, as soon as he set foot inside the castle he understood what the problem was - evil forces were plotting in the past, thus affecting the present. He summoned a portal to the past and warned Sora, Donald and Goofy not to make matters worse by changing things further. Thanks to his guidance and advice, the crisis was contained and the castle was safe once again. 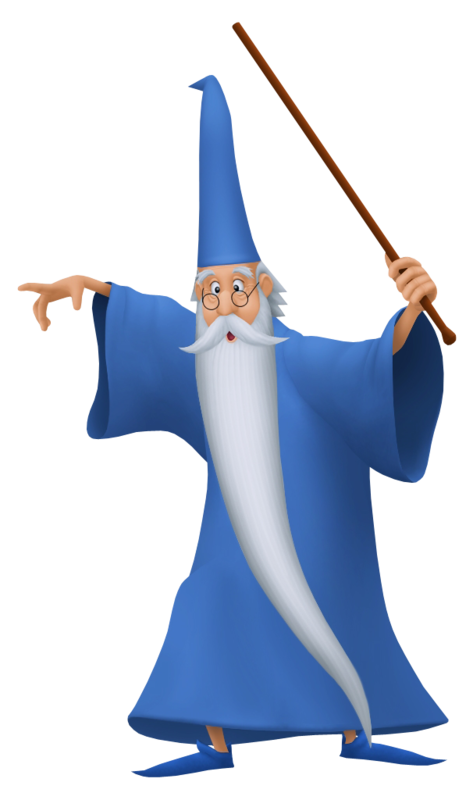 A great and powerful wizard who often travels across the different worlds. He is currently holding on to the mysterious book Terra found. Merlin appeared out of nowhere in front of Terra and seemingly dropped a book before entering his house in Radiant Garden. Terra returned the book to the wizard, but apparently it was not his. He recognized Terra as a fellow "world" traveler and also told him that the book can grant access to the power within. He volunteered to take care of the book and allowed Terra to look at it whenever he wished to. Not long after, Ventus runs into the wizard and Merlin immediately assumes that he is interested in the book as well, although Ventus was actually only looking for Terra. Later that day, Aqua also passes by his house and the wizard, now somewhat exasperated, believed that she was also looking for the book. He mutters that the book was more trouble than it seemed. A wizard beyond compare; his skill and wisdom ranks beyond all in the land. Currently residing in Radiant Garden, he took immediate leave of his home to rush to Yen Sid's aid in the Mysterious Tower where he, along with the Three Good Fairies, put Lea under a crash course in Keyblade wielding in order to assist Sora and Riku in their time of need.